Hot weather is a good time for soap-making. It makes it easy to mix the oils: leave your shea butter and coconut oil on the porch in the sun and they are liquid in 10 minutes. Molds dry quickly in the heat, and the soap doesn’t have any problem gelling – in the winter I have to leave it in the oven overnight (risking a soap volcano!) Summer soap just sits on the counter overnight and it’s ready to go in the morning. A few years ago I started making soap because I was learning mold-making in silicone and urethane and I thought “Now a FIGHT CLUB soap would be a thing” I know a guy with a CNC machine and I had him make me a master out of delrin, which I used to make silicone molds, and – off I went! It was so fun that one day I had the idea of entering “resin sculpture” on ebay and I discovered the joy of remixing other people’s castings into soap molds. I sanded Ganesh’s back down and he made a great mold. The Tiki is an aquarium ornament I filled with clay and siliconed. Beethoven was bonded marble but the bandsaw bisected him beautifully. Beethoven was followed by Mozart, Mao, Caesar and Epicurus. This batch is my “Great White”* recipe, coconut oil, cocoa butter, shea butter, and castor oil, scented with Lemon Balm (thanks Caine!) and Lemongrass and Lemon Verbena. It smells much lemonier than lemon, and doesn’t have citrus oil’s tendency to damage your skin. It’s not too hard to talk me into throwing some soap in a box and shipping you some if you want. But first you have to review and sign my attorney’s safety waiver and promise not to eat any of the soap. If you’ve ever smelled my fudge coffee soap you’ll know that’s actually a danger. Do you ever sleep? You have so many varied interests and abilities. I don’t see how you pack so much into your days to do all that you do. You are one interesting character! I think I would include you on the list of “interesting people that I would like to spend an evening with.” Have you applied for the job of the Dos Equis Most Interesting Man in the World since they have retired the first guy? I recognize those! You should have heard me when I unearthed Ganesh – who sits in in a place of honour, and will never, ever get wet. River did get a quick bite out of the base though. I still have to take photos of everything. Currently using the Bates Motel, because, well, Bates Motel. (My shower curtain is the one from Think Geek – white, with bloody handprints on). Oh, and speaking of eating non-food items – I had thought the rats were going nuts trying to get to Ganesh, but I was wrong – they were after your incense! Just about ripping the studio apart every night. I have moved it, and all has calmed down. Oh, meant to ask – is there any particular reason you don’t just form cones? Have you applied for the job of the Dos Equis Most Interesting Man in the World since they have retired the first guy? My buddy Michael Helms shot the first of those. Basically, the guy walked in for head-shots, Michael shot him, he walked back out, and landed that contract. Quite a day’s work! I go through periods where I just sit around. Then I go through periods where I’m like a methamphetamine-crazed rabid weasel fired out of a railgun. is there any particular reason you don’t just form cones? I’ve made home made soap before, but never anything quite this fancy. I do love the Baby Soap one. Any chance you have a blog or website with the recipe? I’ve been wanting a lemon fragrance, and what you describe sounds perfect. To get it white I add a teaspoon full of titanium dioxide to the mixed oils, and hit it with a stick blender. The Great White recipe has very little scent of its own (a slight cocoa smell) and a sort of ivory hue. You can put pretty much any scent or gel color in it and it’ll carry it nicely. The recipe above is for a largeish batch of soap – you might want to do a half batch first. I tend to always use the maximum water suggestion (and maybe a bit more!) because I hate when my soap seizes. Shall I do some bits on how ridiculously fun it is to make silicone molds? 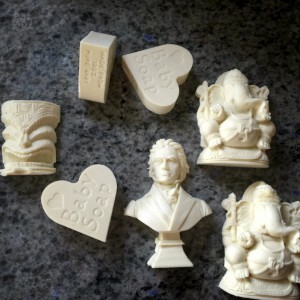 PS – if you want a ganesha or some baby soap, you can find my email address and send me a shipping address and I’ll pop a box o’ weird in the mail toward you eventually. And I thought you were going to be discussing the 80’s TV show. Which actually still holds up pretty well, BTW. I raise dairy goats and of course people do make soap from it. So I get asked constantly if I make soap, but I do not – I am a boring old cheese maker (and therefore blessèd) but I am fascinated with soap making. Also I make molds (but for jewelry)… mine are rubber, and two-sided, so I do know the joy of mold making. Yours look really great – you have excellent detail in them. Personally I love the mold-making process but I have found that not a lot of people know or understand it. I think it would be great if you wrote more about it. And hooray for soap! Seriously? You should know my by now that I have one answer to things like this, yes! Did not find your email but did order two bars of soap. :-) And you know, whenever. I really don’t understand the whole process but is life-casting possible? I have no experience implementing it but I see no reason why one couldn’t do a 3D scan of a person and make a mold that way. Tangent, I once made a mold of my hand with paint-on latex and, just so people can learn from my mistake… if you have any body hair, oil yourself first!!! The first plaster cast I made from it had wrist hair. There are two different approaches: casting and milling. When you mill (or “french mill”) soap you take existing soap that is thoroughly cured, wet it a bit and grind it up, then add scent and press it into molds. You can get 2-sided molds this way – in fact 2-sided molds are required. When you cast the soap you mix the oils and lye and then add the scent and pour it into open molds and let it gel and then dry. If you have a mold cast from life, you can cast soap into it pretty easily. In fact, that was kind of what got me started on my soap-making. Life casting is usually done with alginate (sea kelp good!) gel to make an initial mold, which is then used to make a plaster “master” that can be adjusted with clay and sculpted, then a final mold made in silicone. This link is NSFW. It’s something I haven’t planned to get into talking about on FtB but .. yeah, some formulations of soap take tremendous detail. Add a little whitener and some pigment and it can look amazingly flesh-like. I have been thinking of making a “hand soap” mold – using, of course, my hand. Maybe I’ll do the whole process over a series of posts here, going from alginate to plaster to silicone to soap in silicone to the finished hand soap. Personally I love the mold-making process but I have found that not a lot of people know or understand it. I should try to send you a stainless steel donut. I made donut molds using the lost dunkin process. I have some cookie molds too. Soap cookies! Nom nom nom! I have a mold I made of my ex-g/f’s posterior, because I have a specific art piece in mind that requires a posterior… To give you a rough idea: it took 1/2 gal of platinum cure silicone ($200) and a lot of batting and plaster and weighs about 50# and is pretty awkward. The big advantage you’d get with 3D scanning is that you can do 360-degree objects. To do that with a lifecasting is hard because you have to separate the subject out of it, which is … tricky. I actually believe I solved some of those problems but I haven’t gotten around to publishing any of my trick because I a) lost my model and b) don’t have a way of doing a rotational casting of a 150# mass of plaster and silicone – rotational castings like that would consume about a gallon of resin at a shot and would make an ungodly mess if the mold leaked. Yeah. Alginate just slides right off hair. It’s amazing stuff. If you ever want to play with starter life-casting, go on amazon or ebay or their site and buy the smooth-on lifecasting kit. It’s really well thought-out and is a one-or-two shot for small objects. BTW, the best smelling soap I’ve ever met is monoi tiare from Tahiti. Pope medallions are a great idea!! By the way: don’t google for pope medallions. They are some of the cheesiest garbage I’ve seen in a while – and I regularly study cheesy garbage. So, wikipedia says that’s a variety of geranium.. Arctander doesn’t have an entry on it :( Apparently the preferred process is oil extraction using coconut oil. I suppose the scent must survive processing with lye – I assume they add the scented coconut oil as a superfat late in the process. Hermitage sells an absolute oil. Once you’ve extracted the scent an “absolute” is a concentrated distillation of that, which is why absolute can be so expensive: sometimes a 1oz bottle of some absolute is an acre of flowers, hand-picked. It sounds wonderful and I wish I knew how it compares to ylang-ylang and rose geranium.